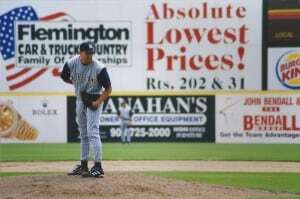 Aaron Heilman during the 2000 Big East Tournament in Bridgewater, N.J. This post is about 11 months too late. I won’t bore you with the details of why — basically a combination of a vacation that followed the interview and the lack of a deadline (this is why I don’t freelance; I can be a terrible self-starter) — but suffice it to say that I would’ve preferred that I posted this last August. This is how quickly it can turn. 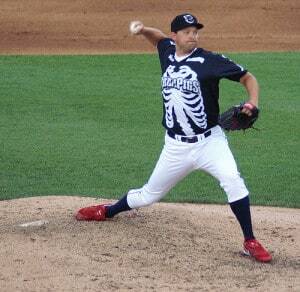 One July day, you’re in the bullpen with the Arizona Diamondbacks, the team that relied on you for 70 games the previous season; two weeks later, after your release, you’re preparing to pitch on “Halloween in July,” marked with a skeleton-themed pullover jersey. 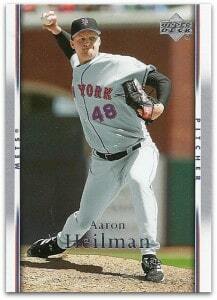 It’s on this night I find Aaron Heilman in the Lehigh Valley IronPigs clubhouse at Coca-Cola Park. When a teammate takes a break from their game of dominoes to get some dinner, I, as a manner of introduction, point out our shared alma mater. We shake hands and I take a seat, but I don’t reveal my allegiance to the Mets just yet. In hindsight, that may be part of my hesitation at writing this post. Because of our college connection — Heilman’s 1998 freshman season at Notre Dame overlapped with my senior spring — I tend to view him in a more favorable light than most (OK, all) Mets fans I know. But then again, I don’t #BlameBeltran for anything, either. While I understand how one mistake can taint you in the eyes of the fanbase for the rest of your career, I can’t bring myself to dwell on the losses. I prefer to just move on to the next game, or the next season, and look forward to the next win. So here we are, the pitcher from Logansport, Ind., and the reporter from the Jersey Shore chatting about South Bend across a table set in the middle of a surprisingly narrow clubhouse for a ballpark built in the last 10 years. IronPigs shuffle by, music blares from a stereo, and out of the corner of my eye, I catch a glimpse from the kitchen of Hall of Famer named Ryne Sandberg, Lehigh Valley’s manager. Some might think that Heilman’s Hoosier roots (his father, Joe, ran track at Indiana University) made Notre Dame an obvious choice for the top in-state baseball prospect in 1997, but it wasn’t his first thought. 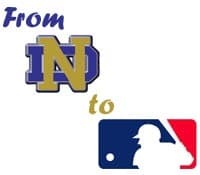 Drafted by the Yankees in the 55th round, Heilman chose college instead, and from the start, he was right for Notre Dame. During his freshman season in 1998, he led the nation with a 1.61 ERA, going 7-3 with nine saves in 31 games (one start). He struck out 78 and walked 19 in 67 innings, holding opponents to a .198 batting average. Those numbers earned him third-team all-America and consensus first-team freshman all-America honors from Collegiate Baseball and second-team all-Big East accolades. He shared Collegiate Baseball‘s freshman of the year award with California’s Xavier Nady and a left-hander from Auburn named Hayden Gliemmo, who was never drafted but played 42 games at Class A Cedar Rapids in 2003, his only professional season. 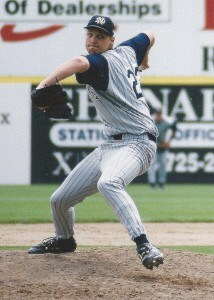 In 1999, his sophomore year, Heilman started 14 of his 20 games, completing six of them, with an 11-2 record and 3.14 ERA. He struck out 118 in 109 innings, breaking Frank Carpin’s 41-year-old single-season Irish strikeout record (which he matched the next season). Heilman’s sophomore campaign included a one-hitter over Miami (he pitched the final five innings, allowing the lone hit in the ninth of a 1-0 win, the first shutout of the Hurricanes in four years) and a 154-pitch win over Creighton in an NCAA regional (he allowed one run on five hits, with six walks and seven strikeouts). The honors came again: third-team all-America from Collegiate Baseball and the American Baseball Coaches Association, and first team all-Big East. Heilman broke out during his junior year in 2000, earning all-America, Big East pitcher of the year and unanimous first-team all-Big East honors following a 10-2, 3.21 season with another 118 strikeouts in 103 2/3 innings. He completed eight of his 14 starts and got into another three games in relief. In a 10-inning win at West Virginia, he tied a Big East record with 18 strikeouts, 10 of which came in the final 12 batters (including seven in a row). The Twins selected him that June with the first selection in the supplemental round, No. 31 overall, but Heilman chose to return to South Bend for his senior season. And what a season that 2001 campaign was: He went 15-0 in 15 starts, completing 12 of them, with a 1.74 ERA and .173 batting average against. The Irish won a program-record 49 games and achieved their first national No. 1 ranking during the season. In 114 innings, Heilman struck out 111 and walked 31, allowing 70 hits and just three homers. He repeated as Big East pitcher of the year (the first since Connecticut’s Charles Nagy in 1987-88), was a consensus first-team all-American and ranked second in the nation in wins and sixth in ERA. He still ranks among the top 10 in 14 of 15 career pitching categories listed in the 2012 Notre Dame Baseball Media Guide, including first in innings (393 2/3), wins (43, against just seven losses) and strikeouts (425, which is 110 more than runner up David Sinnes). His single-season strikeouts totals of 118, 118 and 111 rank as the top three in Notre Dame history. And — if I may borrow from my 2002 self, as you’ll see below — the editors of the student newspaper, The Observer, named him male athlete of the year, ahead of quarterback Matt Lo Vecchio (who led the football team to the Fiesta Bowl) and basketball forward Troy Murphy (who helped the Irish to their first NCAA tournament appearance in 11 years). When draft day came, Heilman’s name was the 18th called — as the first player taken by the New York Mets. At the time, I thought it could only be a good thing — a player from my alma mater chosen by my favorite team. I didn’t think about failure, because I didn’t expect there to be any, not on a grand scale, anyway. Heilman progressed quickly through the Mets’ system, beginning at high-Class A St. Lucie after signing in 2001, splitting 2002 between Double-A Binghamton and Triple-A Norfolk. 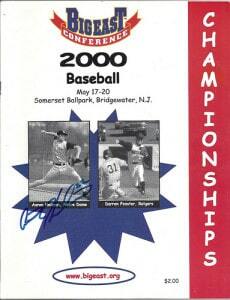 In April 2002, I drove out to Trenton when Binghamton was in town and sat down with Heilman in the visitors’ dugout (click the image to the right for a larger, somewhat readable version of the article). 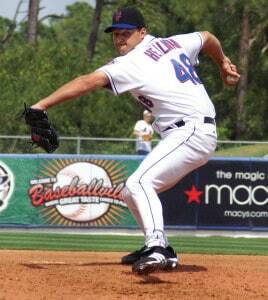 In 2003, Heilman started at Norfolk before making his debut on June 26 against the Marlins. I made sure I was there at Shea Stadium, and a classmate took a train up from Washington, D.C., to join me. The game didn’t turn out like we’d hoped. Though Heilman was only charged with one earned run — singled in by opposing pitcher Dontrelle Willis — some sloppy play by the Mets and Heilman himself led to four unearned runs, three of them scoring on a Miguel Cabrera double in the fourth inning. 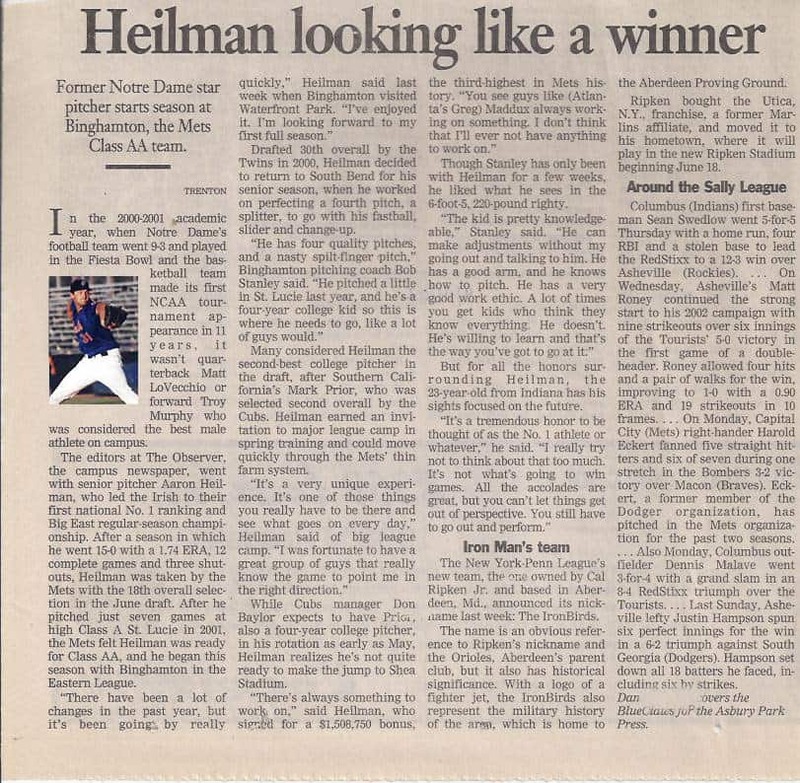 Four starts later, on July 21 in Philadelphia, Heilman notched his first career victory — against the club that had signed him a few days before our interview. He allowed four runs in five innings, but benefitted from eight Mets runs in an 8-6 final. Jason Phillips (3-for-5, three runs, two RBIs, his seventh homer) and Cliff Floyd (2-for-5, two runs, three RBIs, his 16th homer) were the offensive stars, but I must not have been watching, because I remember none of those details. But when I asked Heilman about what moments stand out — so far — in his career, it wasn’t the individual accomplishments that he brought up. Well, not his, at least. 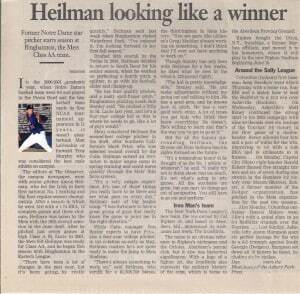 My lasting Mets memory of Heilman’s tenure was a game I didn’t even see. On April 15, 2005, I was sitting in a Midtown bar waiting to meet up with my wife (well, fiancee at the time) and her parents. There was no TV, but a friend of mine texted me what happened at Shea against the Marlins, where Heilman pitched one of the now three dozen one-hitters in Mets history. And moving on is all Heilman can do — and has done — these days, these past two seasons. When I caught up with him, he was back in Triple-A for the first time in seven years. 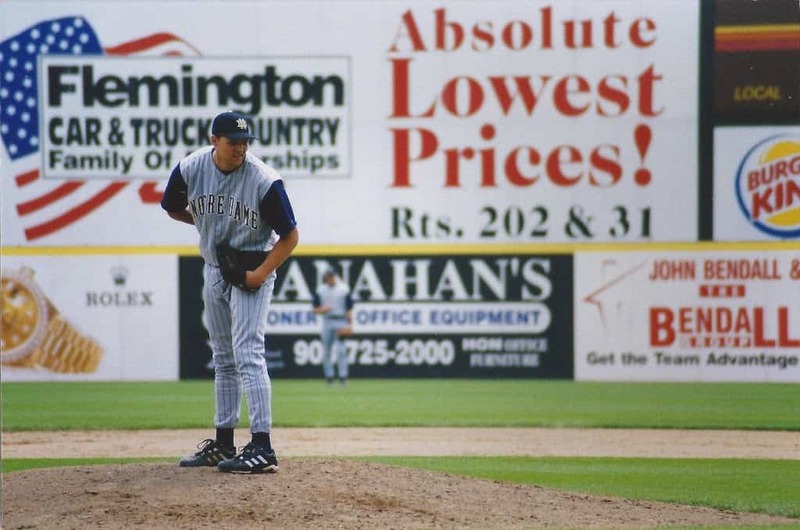 He pitched in nine games with Lehigh Valley, giving up nine runs in 9 2/3 innings. Twenty days after I met with him, the Phillies released him. The day after that, the Pirates signed him and he went 2-0 in seven scoreless appearances with Triple-A Indianapolis, but Pittsburgh didn’t re-sign him. He spent spring training 2012 with the Mariners, but got released. He’s now a sometimes-closer at Triple-A Round Rock in the Rangers’ organization, having finished 10 of 26 games, saving six of them. He’s 1-0 with a 3.58 ERA in 37 2/3 innings. He’s struck out 33, walked 13 and held opponents to a .252 batting average. The numbers are actually pretty solid, comparable to his best with the Mets in 2006-07. But yet, with all the injuries to the Rangers’ rotation, he’s remained at Round Rock while Nolan Ryan, Jon Daniels and the staff in Arlington give their pitching prospects a chance, and rightly so. I thought the end of Heilman’s days in affiliated ball had come back in March and that, when I Googled him today, I’d find him on an independent roster somewhere. So I was happy to see him with Round Rock, but I know that it’s likely only delaying the inevitable. Still, there’s a part of me that hopes Heilman gets one more shot to go out on a high note — something better than the 6.88 ERA he posted last year at Arizona. Realistically, though, I know that D-backs red may be the last Major League uniform he wears, and I’ll just have to think about some of those moments in his first one.